Claire and Adam were meant to be…it just took them a little time to figure that out! Friends since high school, it wasn’t until years later when living across the country from one another, that the timing was finally right for these two lovebirds to figure out they couldn’t live without each other. One fateful night on a return trip to her hometown in Ontario, Canada, over beers and a plate of wings, Adam looked at Claire and said “Move home.” And she realized that he had always been ‘The One’. The rest, they say, is history! 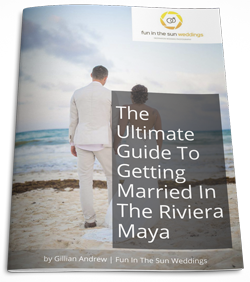 When it came time to plan their wedding, the Bride and Groom decided that since they would be having friends and family from around the world attending their celebration, a destination wedding in the Riviera Maya, one of their most favorite vacation spots, was the perfect place for them all to come together. Claire, not one for bridal dress shopping, did what any Bride-to-Be does these days: She hit Pinterest! She found her perfect beach wedding dress from the comfort of her own house, and then drove from Hamilton, Ontario with her Mom, to Ann Arbor, MI to find it at The Gown Shop. It was the only dress she tried on that day. With tears in her eyes she said “Wrap it up!” Her advice to brides hunting for the perfect beach wedding dresses? 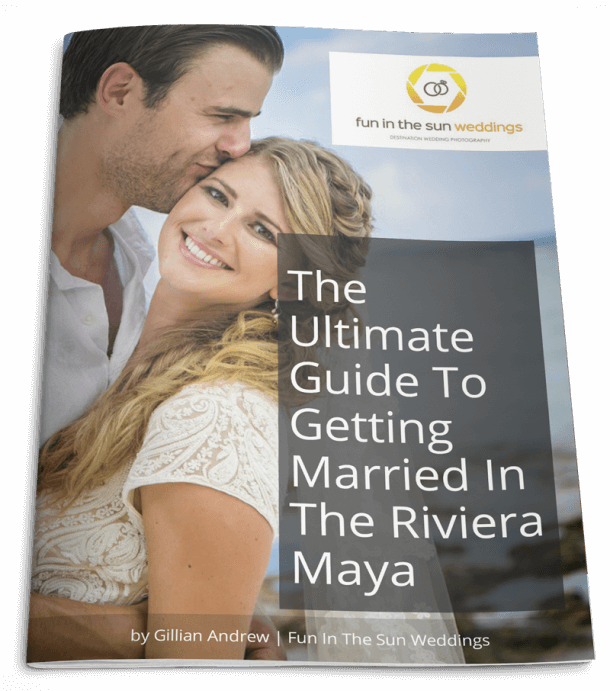 Adam and Claire had their beach wedding at The Riu Palace Riviera Maya. The Father-of-the-Bride was the wedding officiate, giving their wedding ceremony a special touch, and making it one to remember. We asked Claire what the most important element of her wedding day was, and she said it was sharing it with friends and family. If you are looking for the best Playa del Carmen wedding photographers, then contact us today! We are Fun In The Sun Weddings, the best wedding photographers in the Riviera Maya, Mexico. My husband and I had such a wonderful experience with Fun in the Sun Weddings. They are professional and kind. You can but your full trust in their services which helps make your special day effortless. Our pictures turned out amazing!!!!! We can't say enough good things about these guys.